CPG Aeronautics.... » Aquila Repairs Complete! 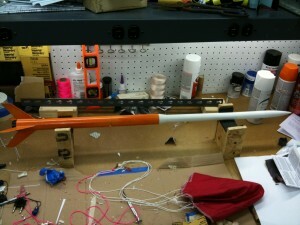 The Aquila launch vehicle Liberty‘s repairs are 100% complete. It was decided to not replace the payload section that was damaged on the last flight. In its place is a solid piece of airframe tubing. The Aquila is scheduled to take to the skies again March 13th 2010. Mission ATS04 will test recovery system modifications for consideration in the construction of the next Aquila rocket, “Aura”.